This is not vintage anymore, this is history! A few days ago I was posting about Kay claiming that they made the first electric guitar, but this 1936 Rickenbacker Spanish Model B is (probably) the real one - actually the first mass produced solid body. Rickenbacker is one of my favorite guitar makers. At 19 when I got myself enough money to buy a serious guitar, I thought Gibson and Fender were boring and common (I still think so thought I have now a Jaguar and wouldn't say no to a Flying V) and thought the only real challenger was Ricken and bought a 620. I still have it and didn't regret it any moment since (brm, brm, sorry to be so voluble about myself...). In these times when you have to choose mainly between soulless clones of once modern guitars and flashy paint-jobs targeted at uneducated teenagers, it's good to find here and there something mixing classicism, originality and sensitivity - like this hand-carved SG of indeterminate brand (or is it all hand-made?). This tasteful work is the work of UK woodcarver Nick Hunter, who has a website where I stole these pictures... I just like it. Don't be afraid, we guitar lovers have to be able to consider the whole range of what guitar is. 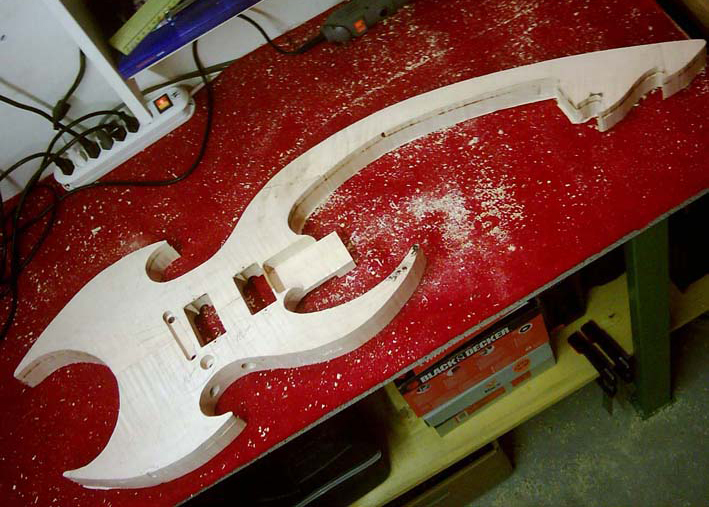 For some people, this is what they expect from a guitar, and that's the point of this post: I invite you to have a look at Crazy Harry's website where you can see the making of the Space Guitar. You may like it or not (you know since the post on the Auerswald that I don't), you have to acknowledge that it requires the same craftsmanship, the same dedication, the same blisters on the fingers to build this (if not more) than a stylish Les Paul or a boring Telecaster. And there are some technical specificities that are quite interesting - see how all the gear is embedded in the body of the guitar... Now who's playing this, that's another question! 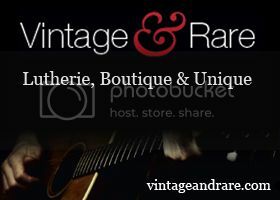 It's quite difficult to find information about this Kent violin bass - Kent was one of these fake brands in the 60s that were used by several companies to penetrate the american budget guitar market. So the Kent brand was first used for this purpose by Teisco and Guyatone for Japan and Korea made guitars, then by Hagström - that was supposed to be an upgrade of the brand. 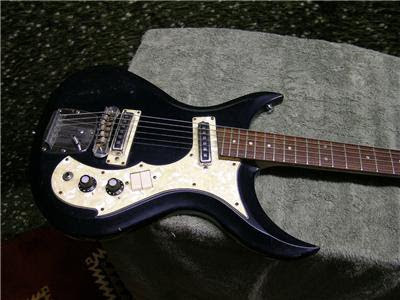 Anyway, this one is a Teisco who - if I understood well - built a similar model under their own name. What is remarkable about this hollow-body bass is the bizarre combination of the violin shape with a cutaway - I can't tell myself if I love it or hate it. 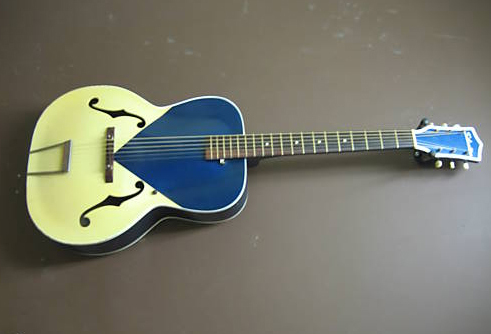 This particular one is even odder with its beautiful 'blueburst' - I imagine that it was a hit back then in 1967... I found contradictory feedback about the sound - some call it crappy and sans-sustain, some say it sounds like a double-bass on steroids. I'd like to try. It's been a while since a double-neck has been shown here, so let's enjoy this guitar/bass Hofner 191 Doubleneck, one of the best design for a double-neck with its body hardly bigger than a regular guitar - a sensible design compared to some huge unplayable monsters of its kind. The necks are probably too parallel to be really comfortable but this 1961 model is just beautiful (you will find a cool series of pictures if you click on the link but don't look at its price). Thanks to David B. for pointing out this guitar. I've always loved the Dean Cadillac, it has the elegance of a true classic and I'm surprised that it doesn't have a better reputation. I guess that a lot of people will look down at it since Dean is renown for making guitars for metalheads - but the same people would die for an Explorer of a Flying V because Gibson started them! The Cadillac is a clear tribute to Gibson's creativity with its mix between a Les Paul and an Explorer, and two beautiful parents cannot make an ugly baby (except Zakk Wylde's ridiculous ZV, but we don't have to mention it more than that). It has the characteristic Dean headstock, which shape is meant to bring volume and mass, hence sustain (in its way this headstock is also a modern classic, sober and dynamic). I have to admit that the Cadillac looses a lot of its beauty without its cream binding, and is anyway at its best in black (would look good also in natural wood finish if it was not spoiled by these inevitable flamed tops). This one even had the right upgrade by replacing the golden hardware (always a little bit cheesy) by black one. Fancy paint on guitars is no news, this Silvertone Blue Kentucky model was issued in 1955, you can imagine it in the hands of some operette cowboy all dressed in white and blue to fit together with the guitar (it was before Village People definitely twisted American macho self-consciousness). Anyway, acoustic archtops are way cool, it's a pity that they almost completely disappeared, vintage cultists should do something about this! Silvertone's budget but appreciated guitars have been produced by several companies in the 60s, this one is a Kay product, so I take the opportunity to mention the King of Kays website, that is not only about Kay - though there is an important information there, that is that Kay claims to be the actual inventors of the electric guitar (to be added to the list) -, but also presents a nice collection of Japanese and European vintage guitars. And even better, you'll find there a series of videos of some of these old ladys being played - that is not so often that they can be more than mere images. The demonstrator is not Steve Vai but he has heart - and guts! There are two beautiful ultra-rare Tokai Gakki Hummingbirds for sale on US eBay these days, but one of them (the one on the top) is somehow a monstrosity since it's an upside-down lefty model turned into a righty. 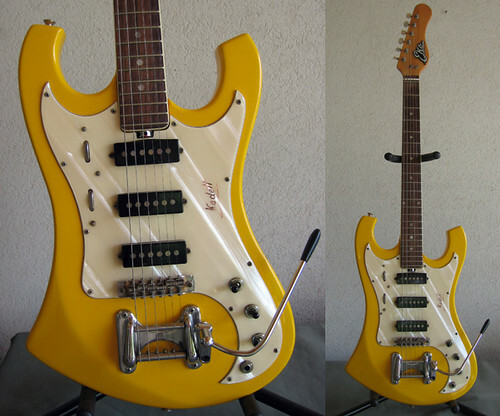 The characteristic of this genius and totally psychedelic guitar (produced around 1967) is its longer pointy lower horn, as you can see on the right - that makes it a kind of hysterical Mosrite (that also inspired the inclined neck pickup). Hard to tell how this lefty was reversed but I can imagine that an uninformed musician could think it's all normal since thus it goes back to what Leo Fender set as the electric guitar common design. When this guitar first caught my eye, I didn't realise that it's a complete fake, one of these 'relic'ed' new guitars (this one is from 2006) that I usually hate (even more when it's done on industrial scale like Fender's). But, well, it's still an interesting modification, so I'll do as if I don't make an unwilling advertisement for an acquisitive guitar torturer. So I like the disrespectful empty pickup cavity and unfilled pot, switch and tune-o-matic holes; also putting an early vintage Bigsby on a new guitar is a good (aesthetical) move. 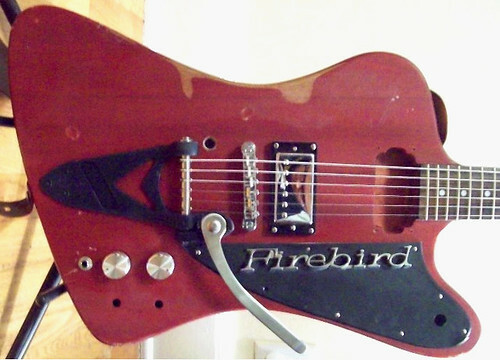 The logo on the pickguard comes from some car also called Firebird (for our American readers, we urban European people can leave an entire life without putting any interest into cars). Of course, the fact that the Firebird is one of my favorite guitars (even more in the hands of PJ Harvey as I already stated on this blog) helped catching my attention - I wouldn't have noticed this mod on a strat. But sanding off a guitar finish to make it look older is in any case definitely inept. I wanted to post about the Cort Jim Triggs thinline hollow-body for a while now, this transparent orange TRG1 is a good opportunity. These really good-looking guitars are hollow-bodies, that means that they have no central beam like semi-hollows - so the stop tail is not screwed on the archtop but is a long model tail piece. I really love the very special and still very simple cutaway, also the tear-drop F-holes. Sobriety and strong impact! The TRG1 has a single neck pickup and a wooden bridge, that makes it what is considered as a jazz guitar. Here on the right is the TRG2 with 2 humbuckers, a Bigsby and a pickguard - and it looks pretty good in black too. 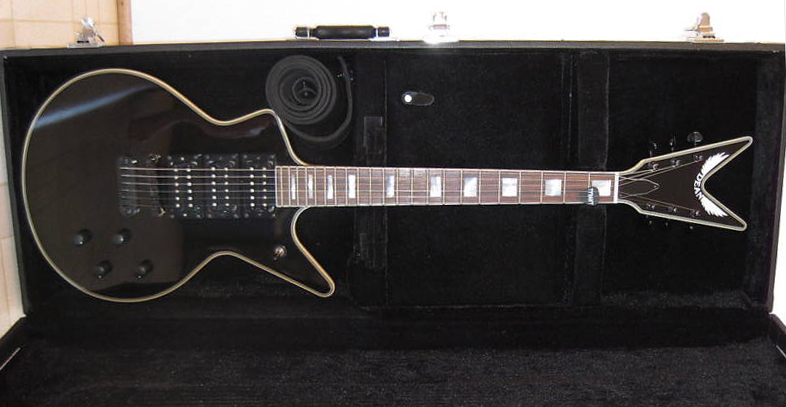 I would put the perfect TRG between these 2 models - with transparent black finish, 2 humbuckers and a stop-tail! The SG zoot suit that you can see a little lower on this blog was not the first laminated wood solid body produced by Gibson. 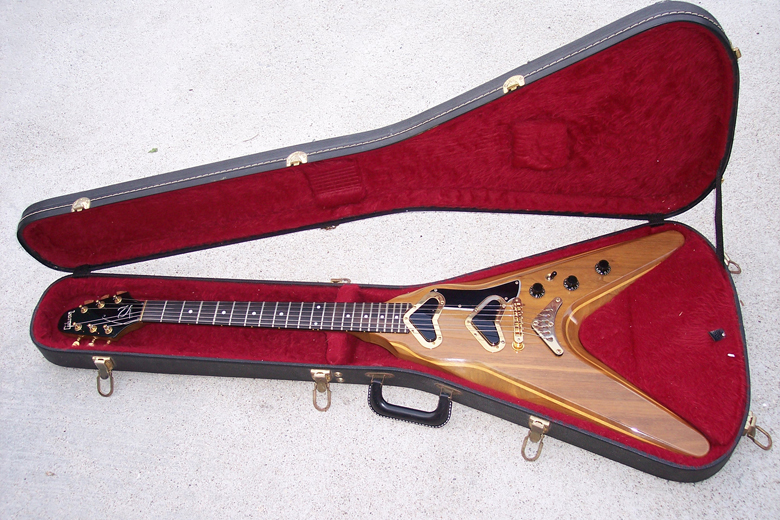 Here is an early 80s Flying V II, made of 5 layers of maple and walnut (you had 2 versions - maple top and walnut top). This is not the only characteristic of this guitar made between 1979 and 1981, look at its contoured body - 30 years before the current trend - and the remarkable boomerang pickups - I couldn't figure out if this shape brings anything to the sound, but I heard that they made the Flying V II one of Gibson's most expensive guitar since they were produced exclusively for this model. I swear, I'm not fixated on these guitars, I don't owe shares in the company (they didn't had that in GDR, did they?) and I'm not even German, but when I browse the web for interesting guitars, the best I can see is most of the time one these Migma/Musima. Everybody agrees about the Italian guitar genius but I more and more believe in something similar but unsuspected for German ones (remember the Jazzgitarren website). This one seems unsophisticated, but it has a very special shape, whose originality comes from simplicity - the best way! You'll notice the tremolo, an interesting solution for an archtop hollow-body, also the 3 pickups, not so common for this type of guitars (and all their knobs and switches!). Ach ja, my GAS is all titillated! NB: There are a lot of blogs STEALING content and bandwidth. 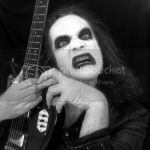 If you read this anywhere else but onguitarz.blogspot.com then you are reading a blog that STEALS content. Please support original bloggers! 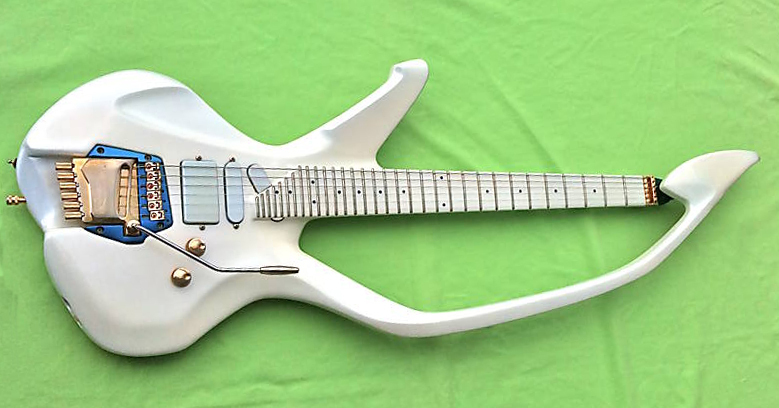 It's about time we featured another bizarre hand-built guitar. The neck on this creation is most certainly from a steel-string acoustic guitar; look at the depth of the heel and also at how the neck meets the body at the 14th fret. The headstock is squared like a Martin, although I seriously doubt someone carved up a Martin guitar to build this (unless one met with an unhappy accident). The woodworking all seems to be highly competent, and would have been carried out by someone who knew what they were doing although I doubt that building guitars was their main focus when it came to craftsmanship. The body shape is distinctive and puts me in mind of an upside-down Wandre Doris. Unfortunately the bridge is missing, and the single LaFayette pickup has been positioned right slap-bang in the centre position, which might be a good compromise but wouldn't appeal to everyone. 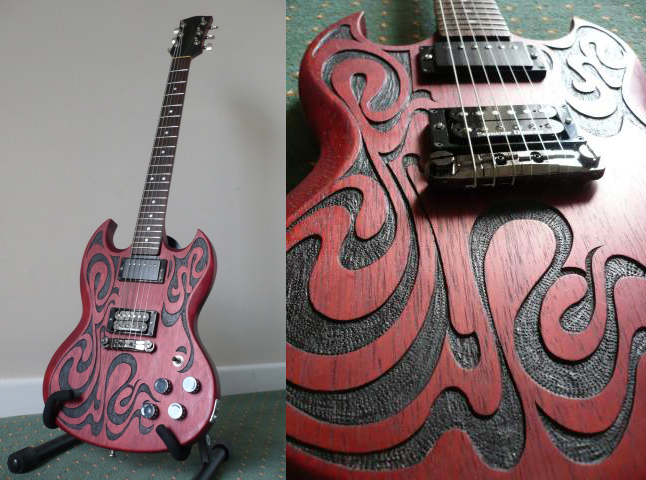 (But then, this was a one-off guitar and it may have been exactly what was required). 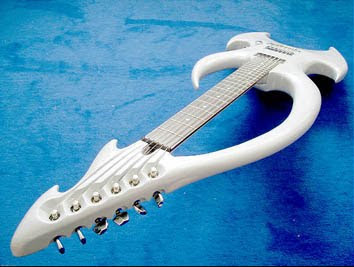 I wouldn't go so far as to label this as a cool guitar, but it's not a hideous one either. It's more of an oddity, and we love oddities on this blog! 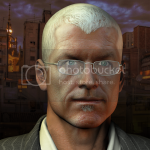 G L Wilson says http://guitarismylifealltime.blogspot.com and http://www.electricguitarshack.info are THIEVING BASTARDS! I've been a little remiss lately in not featuring any left-handed instruments, so here - at the risk of making this blog slightly bass-centric - is a fine example of vintage British guitar-making in the shape of this Wilson Rapier bass. Watkins Electric Music was formed in 1949 in London by the Watkins brothers, Charlie and Reg. 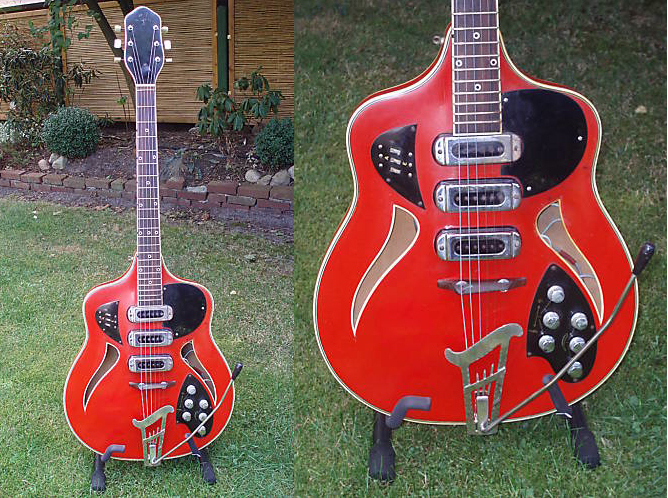 Their first solid electric guitar appeared in 1957, and in 1966 they introduced the Rapier Series as designed by Reg. 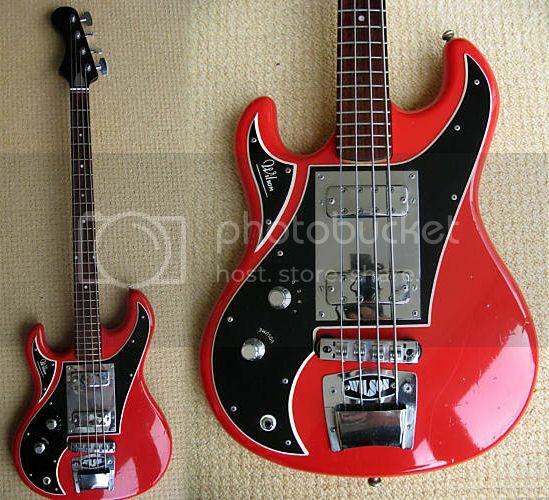 The Rapier bass, however, is stylistically more akin to the Sapphire series guitars - see this example (also a leftie). Guitars made by the Watkins brothers have appeared under the WEM (Watkins Electric Music) brand and, after 1968, the Wilson brand. The Watkins brothers had decided to market their guitars under a separate brand from their amps, and chose Wilson as it was their mother's maiden name. 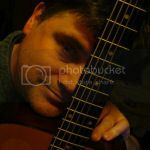 This is also a good opportunity to plug the excellent Watkins Guitar World website from which I found much of this information. I really hate this kind of guitars, but hey, it's part of the family, and this one is quite noticeable with the Auerswald trademark 'sustain bow'. It's supposed to have a terrific sound and extra sustain (and I counted the frets, there are 31 ones, it's much worse than 8 strings). Still the look is a little bit familiar since German luthier Auerswald built a couple of guitars for Prince (I never stopped calling him Prince, and that's cool because he calls himself Prince again now), including the iconic Love Symbol guitar. Check the links for and more pictures and specifications. "Purple rain, purple raaaaaaain !!" 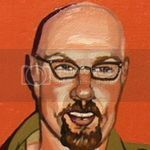 EDIT: There are more and more fake blogs out there, that are stealing material from real blogs, thus also stealing bandwidth. 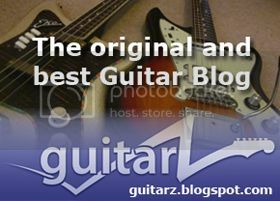 If you read this post on any blog that is not the Guitar Blog > http://guitarz.blogspot.com, you are on such a fake blog that is just trying to get people to click on their ads and make money dishonestly, such as http://www.rehearsalbarn.com/blog/guitar-blog.htm, http://www.boondocksblues.com, http://www.electricguitarshack.info, http://guitarismylifealltime.blogspot.com,... We don't know yet how to prevent this, so the readers must help, please blacklist them and join the real thing. This one is rarer than rocking horse manure. It's a LaBaye 2x4 bass, and it's on eBay right now. Seriously, these hardly ever come up for sale. When was the last time you saw one? For those not in the know, LaBaye 2x4 guitars were produced in the Holman-Woodell factory in Neodesha, Kansas in 1967, and share features and hardware with the Wurlitzer-branded guitars that were built in the same factory. 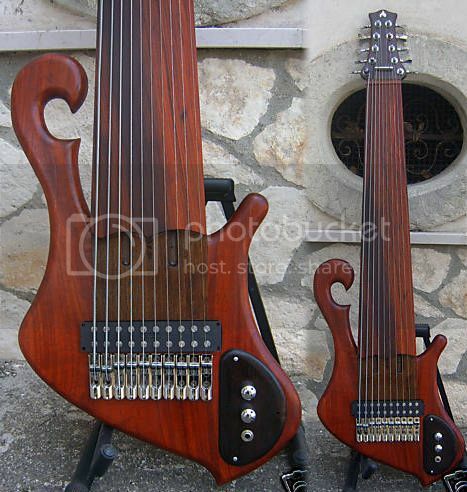 The guitar is so called because it is modeled after a 2-by-4 plank with a neck attached to it. Controls are positioned on the top edge of the guitar except for the pickup selector on the guitar models situated on the bottom edge where it is very easy to inadvertantly knock and change the pickup selection. (The bass only has a single pickup and therefor no selector switch. However, for some reason it has two tone controls, which is peculiar.) 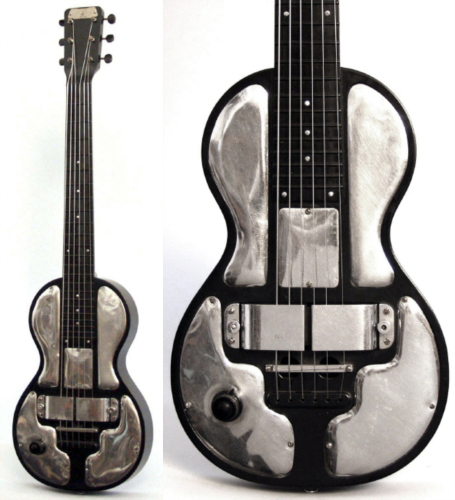 Short-scale bass, guitar and 12-string versions were all produced plus allegedly one or two long-scale basses, but none were successful and production ceased within a year. The only notable player is Devo's Bob Mothersbaugh who uses a LaBaye guitar live on the solo to "Mr DNA" in which he causes all the strings to break by pulling up on the vibrato arm. Fascinating! Definitely one for fans of experimental music (Bertram?). I so wish I'd seen this before I wrote the guitar book! 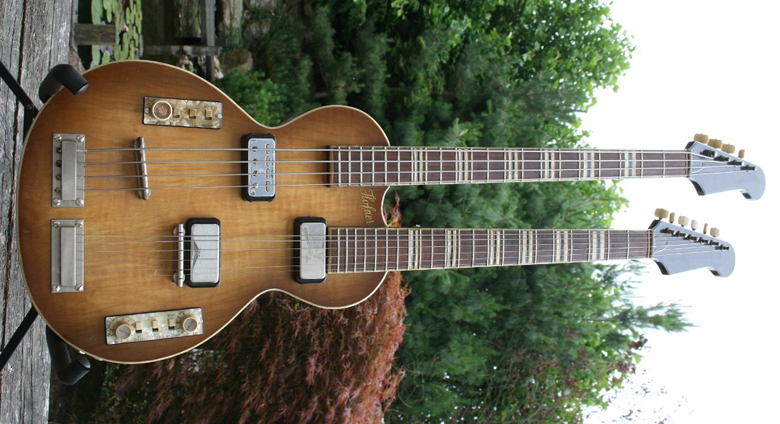 This is a Prometeus 10-string bass, currently on sale on eBay. I've said it before and I will say it again. If you want that many strings just buy a harp! C'mon bass players... how can you justify all those extra strings? I've heard a lot of BS about these instruments opening up new avenues of sonic exploration, but I've never heard a decent piece of music played on one. Admit it - it's just a silly fad amongst some bass players to see who can have the most strings. Just check the demo video of this particular instrument on YouTube. Now, can you honestly tell me that the highest strings on this beast are truly useable? Come to that the sub-bass is pretty ropey too, so it's only really the strings in the centre that are truly playable. The seller, who I assume from the way he writes is also the builder, admits that he himself is really a 4-string player. He must be assuming that there is someone out there daft enough to buy this thing. 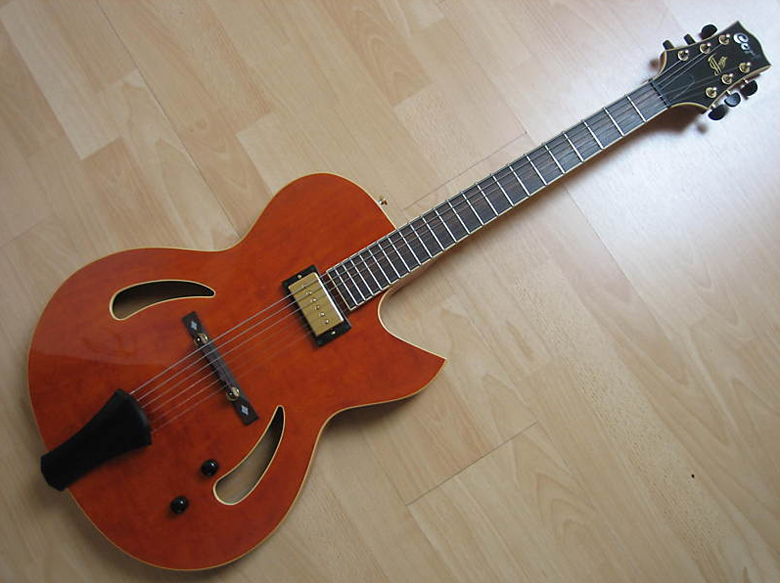 Sorry for the small picture but I really wanted to show this 50s Hopf jazz guitar. I like its shape both very simple and original - one could even say bizarre, almost uneasy: you alter a curve of a few degrees and everything is different! 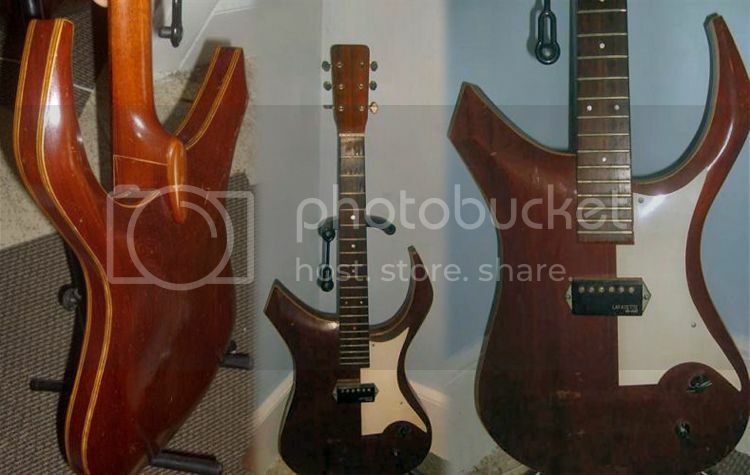 Bad bad me, I stole these pictures on the Fetish Guitar Eko Kadett page (it's not the only Kadett there, it's worth going there and check all these beauties), but the eBay ad where I first spotted it has very bad pics. I love these tough square horns and the pointy top, it makes the design both dynamic and stable. And the trem is another piece of cool steel engineering - like on the Musima guitar I posted about last week. Gibson in laminated SG shock horror! As Bertram stated in the previous post, we don't usually feature new product on this blog, but these particular guitars are wacky enough that I just couldn't ignore them. This new SG Zoot Suit from Gibson is built from dyed pieces of multiple birch wood laminate which has been compressed and bonded to form a solid block of wood. The colours you see are of the actual dyed pieces of laminate - no paints are used - the guitar is finished in two coats of satin nitrocellulose lacquer. Gibson claim that the guitar has enhanced sustain and resonance. So, does everything they've been telling us over the years about tonewoods go out the window? This is basically a laminated guitar, and at £1,999 it hardly comes cheap. I confess that I do quite like the aesthetics of this guitar, although perhaps the slightly more sober-looking black and natural version (below) is more to my tastes. Thanks to Alan P for the tip-off!